We take a look at how built-in voter turnout dashboards are useful when developing election engagement strategies. If you are holding an election, ballot or poll then democracy is clearly important to your organisation. Having gone to the effort preparing for your election and appointing an independent scrutineer, you will want to ensure you get the best possible election participation. All membership organisations want their members to be engaged in the voting process and therefore strive to get the best possible turnout. Clearly, engaging with members goes beyond the election period, however with the right technology and the right scrutineer, tactical and strategic decisions can be made to improve your member engagement and voter turnout during your election and beyond. Voter turnout dashboards are incredibly useful for our clients; they help to determine how best to engage with their membership during an election. Through the votes cast via our online voting system, the voter turnout dashboard can provide real-time reports on demographic groups of members, giving clients the ability to monitor the impact of their member engagement strategies on voting behaviour. Reporting variables are determined before voting begins. Standard variables include voter turnout (real-time, hour, day, week) in addition to further segmentation i.e. voter turnout by location, membership type, gender and age, to name a few. However, the voter turnout dashboard reporting functionality is data-driven, so can be tailored to the client’s requirements. 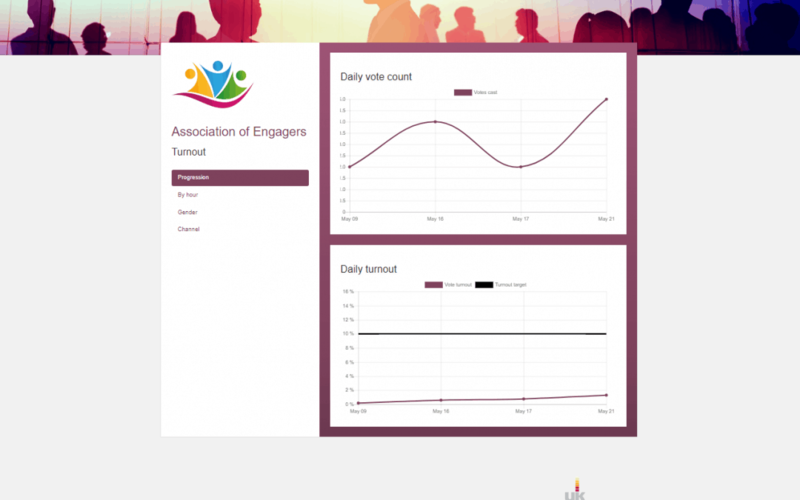 Voter turnout dashboards will show voters reaction to your scheduled communication activity. From this, you can get an understanding of what type of activity is encouraging members to vote. Furthermore, if the voter turnout dashboard shows that you are behind where you would like to be (from a voter turnout perspective), at a certain point in the voting period, it is possible to adjust your scheduled communication activity with unscheduled activity, to boost voter turnout. The most common forms of reminder activity are via email or post. A simple ‘remember to vote’ message is often very effective. Voter turnout dashboards can support more detailed analysis in order to improve long-term engagement, as they provide insight into the groups within your data that did not vote in the election. Based on the variable data report, strategies can be developed and implemented to engage with these groups of non-voters, in advance of the next voting cycle. The insight provided may be related to the election or it may indicate an issue with wider member engagement. Once this information is highlighted, it can then be addressed. To find out more about our voter turnout dashboard visit our e-voting page or contact us by telephone, email or via our contact form.